I wouldn’t normally have any Indian currency around. Euros or US dollars fine, I’m back in both regions regularly and anyway they can be used in lots of places other than the euro zone or the USA. I’ve just used both in Sudan. Nevertheless I was in India – in Bangalore, Hampi, Goa, Ratnagiri and Mumbai in September – and when I came back I still had just over 10,000 rupees in my wallet. The last few days I hadn’t been able to pay for anything, my hotel in Mumbai was looked after (I had a speaking event there), I was taken out for meals, I was even driven to the airport. Never mind, I’m a regular visitor to India, I could use the rupees on the next trip. Even though technically it’s probably illegal to take rupees in and out of India. 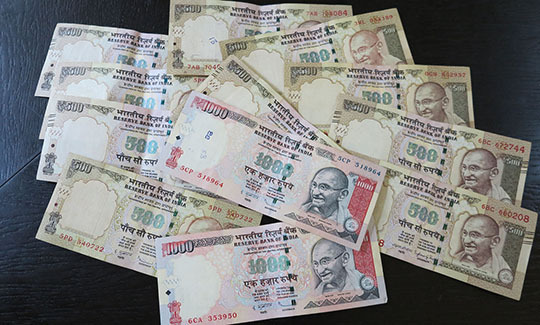 That was fine until 8 November when Indian Prime Minister Narendra Modi suddenly announced that India’s two biggest bank notes (1000 rupees and 500 rupees, worth about US$14.60 and US$7.30) were now no longer legal tender. Boom. India is a cash economy, the average Indian does not have a credit card and those two notes constituted nearly 90% of the country’s cash. Hardly surprisingly the result was chaos, businesses unable to pay their employees, endless queues of people trying to exchange their money before the end of year deadline, empty ATMs, shops unable to make sales because they could not give change. Ridiculous. Will it achieve Modi’s aim of flushing out ‘black money’ from the economy? Probably not, if you’re going to hoard money even in India you don’t hoard it in notes with a maximum value of under US$15. Indians intent on hoarding something of value will probably head for gold or an international currency like the euro or US dollar. Have other countries tried a similar idea? Yes, but they were usually failed states like Myanmar or North Korea, countries that did not have any concern about the welfare of their citizens. And the results were usually disastrous, people die in these sort of experiments although in North Korea the deaths included the execution of the guy who dreamt the idea up. Not Kim Jong-il of course, although he probably did dream it up. ▲ The Zimbabwe 100 trillion dollar note which still lives in my wallet. Meanwhile another country is also heading towards a currency crash: Zimbabwe. Back in 2011 I blogged about how the Zimbabwe economy had returned to a semblance of stability when they dumped the disastrous Zimbabwe dollar and turned to the US dollar. Quite a list of countries use somebody else’s currency, usually US dollars or euros. Even wealthy Monaco dispenses euros from their ATMs even though Monaco is not part of the euro zone. It certainly keeps a country honest when they use somebody else’s currency, they can’t just print more of them, which was the problem that crippled the Greek economy. So for a number of years Zimbabwe has been honest and if you went to an ATM in Harare, the Zimbabwe capital, you could draw out US dollars. Now, heading towards badly managed financial disaster yet again, Mugabe and his clever mob have found a way to undermine the US dollar. They’ve told the hard-done-by citizens of Zimbabwe that their bank accounts into which they had deposited US dollars now have Zimbabwe government issued ‘bond notes’ each of them worth exactly one US dollar. Of course they’re not and Zimbabwe is rapidly spiralling, yet again, towards economic collapse. Money is a funny thing, it’s based on trust and if you don’t trust it the money in your wallet can quickly become worthless.